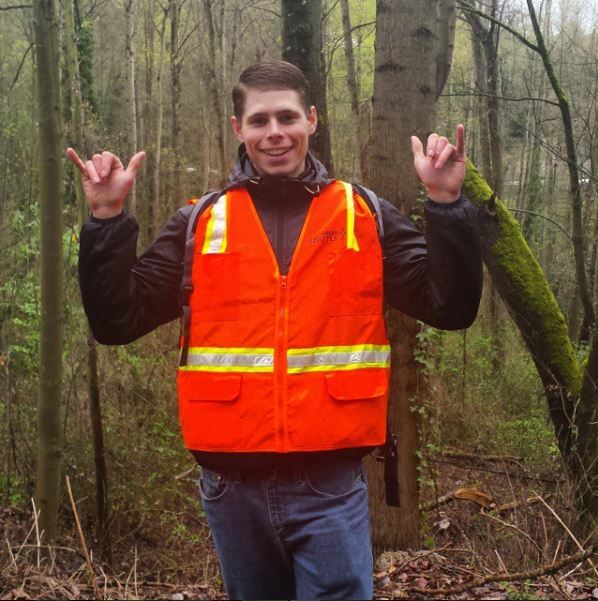 Matthew H is your friendly new forest steward in the East Duwamish Greenbelt at Horton. It is the forest you know, but but didn’t know you knew. My 1st priority for becoming a GSP forest steward was and still is to restore the ecosystems and habitat that have existed in the East Duwamish Greenbelt (EDGB) for so long. My 2nd priority was and still is to make the EDGB one of the most comfortable, inspiring and awe-inducing green spaces in Seattle; I want it to become a place that people feel safe venturing into and where they can enjoyably connect with fellow members of the community. Urban forests are important in my neighborhood because for the longest time the greenbelt has been neglected and treated as a trash dump. That is not what it should be. Our green spaces should be treated with respect, and should be safe havens for positive, constructive, fun activities. Why? Because our green spaces do so much good for us. One benefit is the reduction in many types of pollution both in the air and water. I find that particularly applicable to Beacon Hill and the EDGB, as I-5, a massive source of air pollution runs along the entire west side of the hill. If the forest wasn’t there to filter out the pollution coming from all the cars on the freeway, Beacon Hill’s population would almost certainly have much higher rates of respiratory diseases and other health ailments caused by air pollution. Another benefit of healthy, well cared for urban forests is that they reduce crime. Why? Some of our greenbelts are so overgrown and full of trash that no one who doesn’t already live around there feels safe going for a stroll through it. Now just imagine if the EDGB looked like Discovery Park. People feel much safer going for a hike in there, because it is well cared for and they know that the majority of other people they come across on their hike are doing the same thing they are: enjoying the greenery, scenery and the feel of fresh forest air. The same place-making that has made Discovery what it is, can, needs to be and is being done for the EDGB. The coolest part of forest stewarding so far is meeting people in the neighborhood that I have never met before and connecting with them on the work that us forest stewards are doing. Everyone I have talked with so far has expressed gratitude and excitement about the work that is taking place, which makes my day every day. Coming into the site I wasn’t sure how people in the neighborhood would react to work being done on it, and to see them be supportive and appreciative is really, really cool. 10 years from now and beyond I envision my site to look like a pristine, untouched chunk of wilderness. I want it to have minimal-impact educational trails built through it that help all people, but especially youth, better understand the awesomeness that permeates the entire EDGB, and the benefits that we receive from taking good care of it. There are few other places that are as good as forested parklands to contemplate life, get in touch with what is most important to you, and have fun. July 16 is the next volunteer event. Check the GSP event calendar for the next event at East Duwamish GS: Beacon Ave S.